Enforcer Jamie Cudmore toes the disciplinary tightrope on regular occasions and sometimes falls foul of the disciplinary officer. 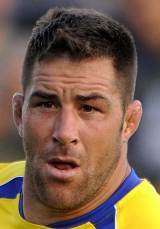 Cudmore - who currently plies his trade for Clermont Auverge - has previously lined up for Llanelli RFC and FC Grenoble - and has a reputation as one of rugby's toughest and most ruthless players. Having appeared for Canada in the 2003 and 2007 World Cup, Cudmore spent four years in the international wilderness due to club duties, injuries, suspensions and family issues. He picked up two suspensions in the 2010-11 season for club side Clermont - a 70-day ban for stamping on Jacques Burger and a 40-day ban after being found guilty of punching Perpignan's Gregory Le Corvec. Cudmore played a key role for Canada during the 2011 World Cup appearing in all four of their group games.